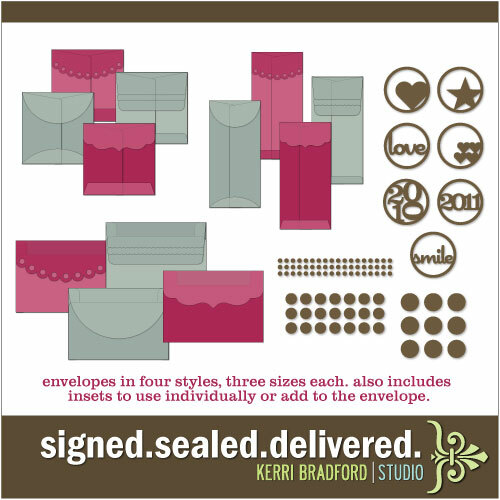 This new envelope kit consists of 4 different styles of envelopes in three different sizes: square, rectangle, and long. You can easily punch or make a circle, add a brad or eyelet, and turn it into a policy-style envelope too (an enclosure with a string). You can back it with patterned paper, a transparency–plain or printed, or just leave it open to reveal what’s inside! Use the year insets for your envelope to hold photos or cds from the year. And my most favorite thing? The tear-away envelope! I think it adds such a fun little twist to your envelopes. Just add adhesive to the bottom portion–below the tear away. I think it would even be fun to use this style of an envelope in your scrapbooks. Something fun and different. Make it, seal it, “tear it open”, and then put it into your scrapbook. I like. 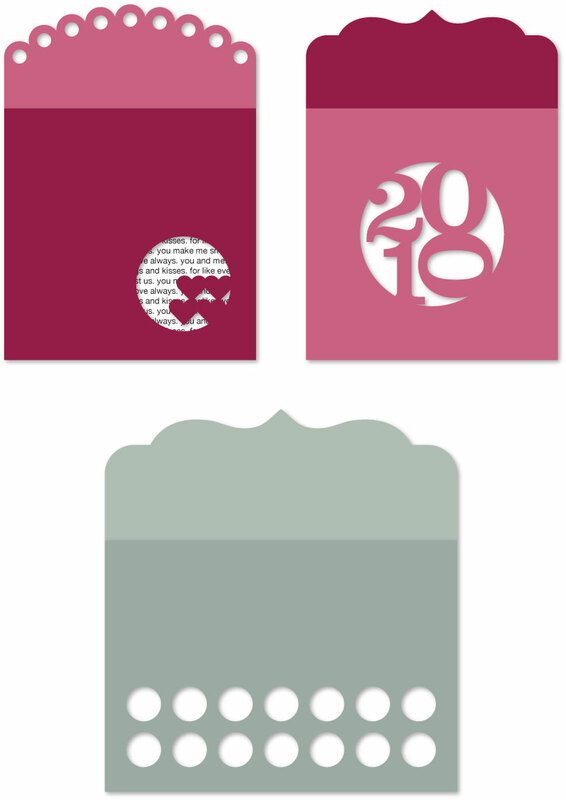 All the envelopes and insets come in SVG/GSD/DXF and the insets come in JPG and PNG as well. I hope you all had a Merry Christmas! Thank you for all the wonderful wishes too! I will have to update y’all on our phone conversation with my boy. Can’t believe he has about 3 1/2 months left! well now aren't these awesome?! Cool envelopes. Thanks! What are the actual dimensions of these, or can you make them any size you want? They're very cool! Diane, you can make them whatever size you want…well, you are limited to your cutting machine. If there's a certain measurement you need when it's all put together, make a rectangle or square in the size you need and place it over the dashed area of the envelope (the fold lines) Select the envelope and size it so the dashed area fits that shape. just love that tear away idea. You are so awesome. these are very nice. i have to watch my pennies so i will save up for this one. will they fit in the sizzix big shot? Are you wanting to emboss the envelope? I'm not sure just how wide the Big Shot is, but probably the maximum width to run the cut envelope through–unfolded– would be 8". You might could fold it and emboss through a couple layers and see how that would work. Oh my! These are AMAZING!! Do they work with the Cricut? Would you believe I’ve never plugged it into my computer…but if I can use this w/it…I certainly will!!! I love these! They do work with Cricut, but only if you have SCAL version 2 or MTC from earlier this year. Provo Craft sued both companies and they can no longer make their software work with Cricut. Sadness. Hopefully PC will make a program someday that will allow users to work with SVG files. So would they work with the Cricut Design Studio? Sorry for so many questions, just trying to figure all this out. Sorry. Nope. Design Studio doesn’t handle SVG files. Unless they change their mind someday…. Ah ok…got it now. Thank you!! !